There is a lot of concern on the internet about getting LASIK with a lazy eye (Amblyopia), and although I can be no more informative then a simple search on Wikpedia when it comes to what causes a lazy eye, I can at least throw in my two cents on my experience. Let us start at the beginning. 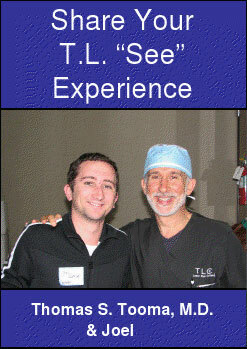 So I went in for LASIK on Friday May 15th at 8:00am at the Newport Beach TLC Laser Eye Center. I was immediately taken back to do some final testing. They took some readings on my eyes, did another eye test (like you would for an every day eye exam) and was then given a rundown on the post-operative care I was to carry out. From there they took me off to the relaxation area where I was given a Xanax and a bunch of initial drops for my eyes. After about 20 minutes of watching Planet Earth on a big LCD and letting the drops and Xanax kick in, Dr. Tooma stepped out and said it was time to go. As i was being brought in for the procedure, I saw Jenn come in to the viewing area. By this point you would think the Xanax would have calmed me down but I was pretty darn nervous. Dr. Tooma first make some markings with a pen on my eye (by this point my eye was completely numb of any feeling) and sat me in the first chair. After that it was just one step after the next until the final point where they say your good to go. There is a point where you are nearly blind moving from one operating chair to the next, but outside of that the procedure is very straight forward and rather easy. I came home took half of a Xanax fell asleep ate lunch and dinner had another half of a Xanax and called it a day. I came back for my followup check in the next morning to see my progress and how I was coming along. There was no problems found and the amazing news was that my left eye (my lazy eye) was actually seeing better then my good eye, and both were seeing 20/20. I was told prior to the operation that my best was 20/40 but as of right now I am seeing nearly perfect in both eyes. I am now 3 days post surgery and loving every minute. To this point I see better then I ever did with glasses both in my good eye and lazy eye. And although I was really nervous to get the procedure I would get it all over again if faced with the decision again. All in the ability to wake up and see without having to scramble for my glasses has been amazing. The heavy regment of eye drops can be a bit demanding at times, but with all things being equal it is well worth it for now having 20/20 vision.